Pangarap Village lives up to its name. Around 40,000 residents have woven and triumphed dreams and hopes for themselves, their kin and children, and for their grandchildren in the future. They are a community of people who keep their dreams alive – people who built homes and maintain small-scale businesses. They also have a local school for both elementary and high school students and a place for worship to thank God for their strength and blessings. However, a certain Greggy Araneta is claiming land ownership to the 156-hectare land north of Caloocan City. Gregorio Ma. “Greggy” Araneta III is CEO of Araneta Properties Inc., a real estate company, and also an executive of Carmel Development Inc. (CDI) (formerly known as Carmen Farm, Inc.). He came from the wealthy clan of the Aranetas and is uncle to Department of Interior and Local Government (DILG) Secretary Mar Roxas. Through Presidential Decree (PD) 293, late president Ferdinand Marcos in 1970s cancelled all sale contracts of CDI in Pangarap Village, and granted the land to employees of Malacañang and urban poor families. But in 1988, during the term of late president Corazon Aquino, the Supreme Court ruled PD 293 null and void. Since then, the residents of Pangarap Village have been struggling for their rights to their homes. Anyone who enters Pangarap Village is welcomed with a huge banner, saying the land is owned by Carmel Development, Inc. But unlike government-owned lands, residents of Pangarap Village, composed of barangays 181 and 182, will not be given relocation. Because Araneta claims the land as his private property, he is not liable to its residents, giving him the “authority” to do whatever he likes. When the Manila Today team visited the village last June 17, we were able to confirm that the residents are deprived of basic necessities. On the same day, they held a protest rally outside the DILG office. They sought help, hoping the government would intervene to the harassments the residents suffer from Araneta. A dialogue was held between Pangarap village barangay officials and representatives from DILG. The government agency made a promise that it will look into the cases of harassment perpetrated against the residents.The residents identified Araneta as the one behind a series of harassment tactics to drive the residents away from Pangarap Village, which already resulted for some residents to leave the village for good. Based from interviews and onsite investigation that our team conducted, below are the cases of harassment against the residents. For several months already, many residents of Pangarap Village have only been getting power supply from submeters, which they buy for P25 per kilowatt hour (almost 50% higher than a regular Meralco fee), and solar panel (one resident bought her solar panel set for P19,000). Those who are not able afford any of the two resort to candles and gas lamps. Caloocan Mayor Oca Malapitan also donated power generators to barangay halls and Pangarap Village School to continue their operations. Generator used in Pangarap Village School. Every time barangay officials ask Meralco to fix their power lines, CDI blocks the electric company equipment from entering the village. Power supply in some parts of Pangarap Village was cut since November last year, according to residents, while power supply in other parts was cut early this year. When we asked barangay 181 officials how it was possible, one official said the power transformer was destroyed by CDI personnel. A local official said that in the past, CDI allowed Meralco to enter the premises as long as residents got permit. Now the harassment has become severe. In Barangay 182, as the team was talking to another barangay official, the generator stopped because it was raining so hard. We had to talk in the dark, and their operations had to stop. 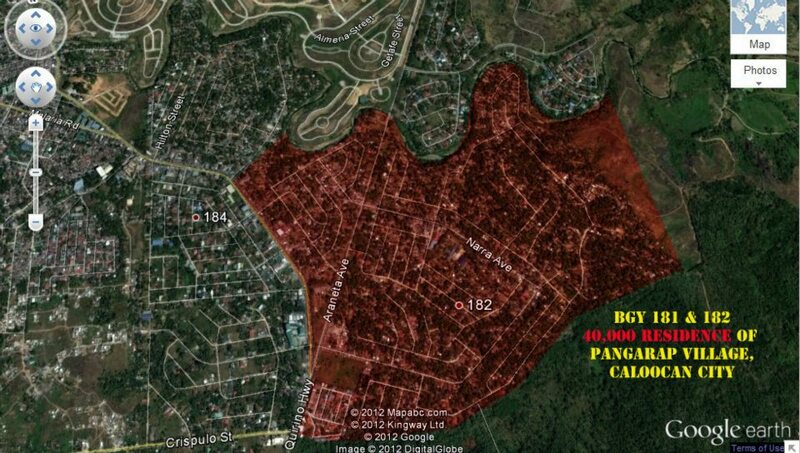 During the night, streets in Pangarap Village are pitch dark, causing a spike in petty crimes. Even classes in high school are required to end by 5pm so students can go home while there is still light. Before, classes end at 6pm. When our team entered Pangarap Village, we passed through a narrow entrance along the sides of the village. The car we used also had to be parked outside the village as it was not allowed to enter. Public utility vehicles are not allowed to enter the village, only tricycles are allowed to operate, but within the premises only. The main entrance points to Pangarap Village are blocked with boom barriers and guarded by security personnel. They inspect every person who enters the village, and only vehicles with CDI authorization are allowed to go in. Public utility vehicles are not allowed to enter the village, only tricycles are allowed to operate, but within the premises only; while only single motorcycles are allowed to enter and exit the village. Because of this, those who own sari-sari stores are forced to hand-carry their heavy loads of items inside the village. Even dead people are not spared of the burden. “‘Pag may patay ka dito, hindi ka basta-basta makakapasok. Kelangan hihingi ka pa ng permit. At sila ang mag-iiskedyul ng libing kung kelan (If you have a dead relative here, you cannot easily enter the village. You must ask for permit first. Even the burial schedule are in the hands of CDI officials. ),” said Diana Perez, who has been residing in Pangarap Village since 1986. Road blockage is real burden for the residents especially during emergencies – when there is fire or health emergencies. “Nung inatake ako no’ng 2012, hypertension, ‘di ako makahinga. Sa bagay yun makakapasok pa ‘yung sasakyan kaya lang iikot ka dun, malayong malayo, sa likod ng school, ‘di pa nila sinarhan ‘yan. Dun ako nahirapan, muntik na rin akong ‘di umabot sa ospital,” added Perez. One can only imagine that when life is at stake, a permit still needs to be processed, or die. “Madalas pong emergency dito mga inaatake. Ang habol lang naman sana naming halimbawa may emergency, padaanin (‘yung sasakyan) (The usual emergency here is due to blood pressure shooting up. What we are asking for is to allow vehicles to pass when there’s an emergency),” a barangay official said. Scores of bomb threats in Pangarap Village School had forced at least two principals to resign. Also, according to a grade school teacher, a number of students had transferred to another school. She cannot even count the number of bomb threats that their school have been receiving for years. The most recent incident was last June 15. “Sa eskwelahan bomb threat lagi, siguro pang ilang principal na ang umalis dahil sa bomb threat (In our school, there is always a bomb threat that caused several principals to leave),” she said, explaining that they had to postpone their classes several times due to bomb threats. On June 6, a fire took their library building allegedly due to electrical faulty wiring. But residents doubt it was the real reason because there was no electricity during that time. She also complained that the sound from the generator draws setbacks in their classes everyday. Now that their library was gutted by fire, they could only wish that another set of books would be delivered to them. “Sagabal na sagabal ang tunog ng generator, hindi kami magkaintindihan, tapos yung air pollution pa, ‘yung amoy (The sound of the generator is really a distraction for us. We cannot understand each other. The toxic fumes also cause air pollution),” Teacher Rose said. As our team walked around Pangarap Village, we noticed that many of their roads have been neglected. Walking is hard because the road is rugged with rock. We had to take caution or else a simple slip could cause physical injuries. Residents said heavy equipment used in fixing the road is not allowed to enter their village, leaving their roads in such dire situation. “Ang hinihingi namin ay bigyang emphasis yung basic necessities ng mga tao tulad ng patubig, pailaw, papasukin ang Meralco, paglilinis at pagpuputol ng mga puno. It’s almost two years na ‘di sila pumapasok sa Pangarap para i-clearing ‘yung mga branches, ang nagiging dahilan ng mga pagputok-putok ng mga wirings. At ‘yung mga health services na ‘di pumapasok samin tulad ng ‘di nila pinapapasok yung mga sasakyan ng city,” said Barangay 182 Kagawad Manny Llorca. “Natatakot kami, ‘yung mga guwardiya kasi ‘pag tumitingin dito, lalo na ‘yung service nila ‘pag dumadaan, akala mo tinutunaw na kami. Biruin mo yung service nila, akala mo military na sila, may ekis sila na baril,” said Tuti Lumacang, a resident of Pangarap Village since 1977. Sol Gomez was vocal in criticizing Greggy Araneta for claiming the lands of Pangarap Village. Photo from Support Pangarap Village FB page. Anyone who wishes to enter Pangarap Village is welcomed by security guards with guns at the entrance points of the village. Anyone who wishes to enter Pangarap Village is greeted by security guards with guns at the entrance points of the village. According to residents, the guards also make the rounds in every street. While they look like the usual security guards during the day, but at night, residents would see them carrying high-powered firearms. The decades-long land dispute in Pangarap Village has also triggered several incidents of murder. Residents said at least four people have been killed in relation to the dispute. Photo by Rommel Fortades before he was killed while protesting. Courtesy of Support Pangarap Village Facebook page. In 2011, Rommel Fortades and Soliman Gomez were killed by an allegedly drunk security guard of CDI during a vigil protest of residents against demolition. It was only a year after their deaths that the Department of Justice had responded to the case and opened a preliminary investigation. “‘Pag palaban ka eh talagang tinatakot ka ‘pag ‘di ka pa tumigil titirahin ka, o sa madaling salita, papatayin ka (If you are really vocal, they will intimidate you. If that does not stop you, they will put your life in their hands. ),” said Lumacang. Barangay officials said dialogues with DILG Undersecretary Tom Villarin and Etta Rosales of Commission on Human Rights had been conducted in the past. But government officials showed that they were not serious in their response. The harassments happen along with the plan of the national government to build MRT-7 that will run from EDSA to San Jose Del Monte, Bulacan. An MRT-7 station will be built along Pangarap Village. It was reported that Araneta plans to convert the area into a new central district. “Handa naming ipaglaban ang paninirahan namin. Bakit paalasin pa kami, nandito na kami? Noong araw, nung talahib pa lang ‘to, ‘di nila pinapansin ‘yung lugar. Residents are hoping that their dialogue with DILG Undersecretary Austere Panadero will be given attention. But it will not hinder them from taking other courses of action. “Handa naming ipaglaban ang paninirahan namin. Bakit paalasin pa kami, nandito na kami? Noong araw, nung talahib pa lang ‘to, ‘di nila pinapansin ‘yung lugar. Hindi naman namin ‘to hinihingi eh kundi kung pababayaran sa’min ng gobyerno, eh di babayaran namin. ‘Yun ang hinihiling namin na safety at tumigil na sila sa pangha-harass, at bigyan ng aksyon ng gobyerno,” concluded Lumacang. Previous articleAfter the Pride March: We have to step up and step out!